The Subcommission on the Systematics of Metamorphic Rocks (SCMR) is a branch of the IUGS Commission on the Systematics in Petrology (CSP). 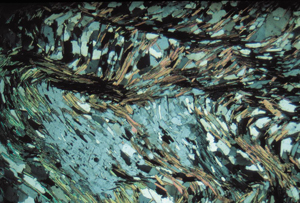 Many terms in metamorphic petrology are ambiguous or are used inconsistently. In order to address this problem the aim of the SCMR is the preparation	and maintenance of a unified nomenclature scheme and to recommend definitions which are widely acceptable and of international use. The SCMR has now completed its initial remit and has produced a series of specialist recommendations and an associated glossary. The SCMR welcomes comments on its recommendations. It also recognises that the science continues to evolve and as new discoveries are made, and new understandings develop, the terminology has to develop in parallel. Suggestions on updates or improvements to the recommendations are welcome	and will be published as appropriate on this website. All comments to Webmaster. The recommendations and glossary of the SCMR were published in August 2007 by Cambridge University Press (CUP) (www.cambridge.org/uk). The title is 'Metamorphic Rocks: A Classification and Glossary of	Terms', The ISBN is 13.9780521868105. Further details may be obtained from the CUP website. A poster was displayed at the IUGS Congress in Florence summarising the work of the SCMR. Click here to download a copy.